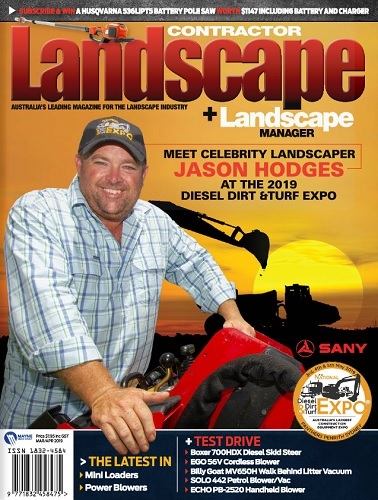 When Jamie Andrews established his landscaping and mowing business in the lower Blue Mountains west of Sydney around nine years ago, he quickly discovered that being able to complete tasks quickly was the key to a profitable business. JRA provides a full range of landscaping and mowing services toresidential and commercial customers between Penrith and Katoomba in the Blue Mountains district. “When we started the business all the work was done manually and some days it got pretty tough,” Jamie recalled. “It didn’t take us long to realise the key to a successful landscaping business was having the right tools and equipment to complete jobs in the shortest time possible. We started hiring equipment, and this was a great way to find out what equipment worked best for us. “The Blue Mountains district has its own set of challenges. It’s an area that can receive high rainfall and there are often steep, slippery gradients of tight access that need to be managed,” said Jamie. 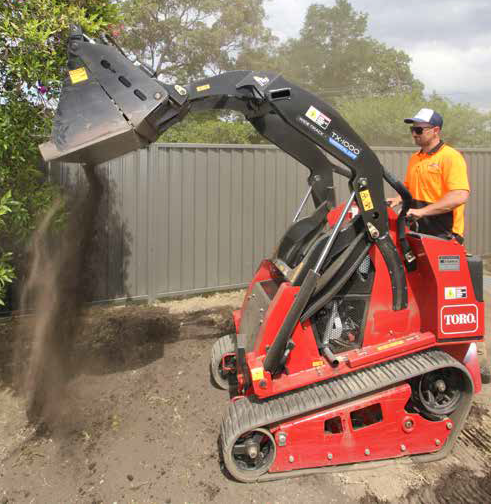 “We checked out many different brands and machine configurations, butat the end of the day we decided on a Toro TX 1000 stand-on track loader that promised all the features, benefits and value that we were seeking. It was great to discover that we made the right choice: the Toro machine did everything we were asking for and more. It’s certainly unbeatable and an ideal solution for our business. 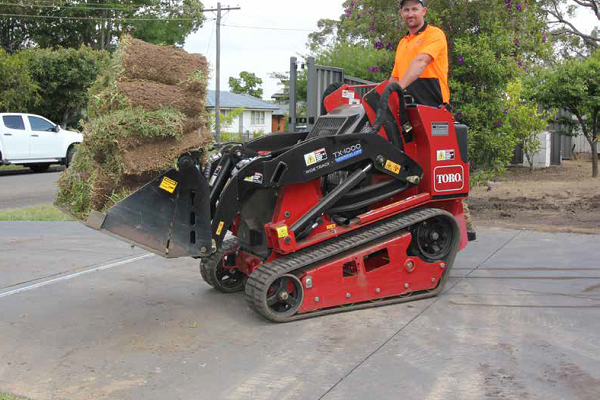 “Initially, we were looking at an entry-level sit in loader however because our landscaping work requires us to be constantly on and off the machine, a stand-on solution like that presented by the TX 1000 was the best choice for us. “As the operator’s position is the highest point of the equipment, you have a 360-degree view of the work area, providing great visibility to see exactly what’s around them, where any obstacles may be, or where they need to drop a load or level a surface. In terms of safety, the minute the operator leaves the standing platform, the machine stops immediately. This combination of high visibility, easy positive controls and safety contributes to making every task very fast and safe. “One of the first things an operator notices about the TX 1000 is its incredible stability. At no stage do you ever feel you’re in danger of tipping or losing control of the work. 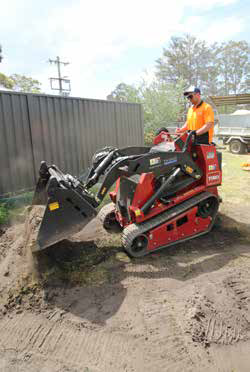 “As well as a very efficient 4-in-1 bucket, we purchased an auger and a ripper attachment that lets us tackle tough ground conditions such as the removal of embedded concrete or rock, prior to laying lawn base. The design of the Toro is very thoughtful and designed for simplicity so that any of its attachments may be changed very easily and in a matter of minutes. “The sheer grunt and power of the Toro TX 1000 continues to surprise us. At no time does the machine ever feel stressed or labours, regardless of the load we ask it to carry or the constrained spaces into which we often need to manoeuvre it,” said Jamie. “Because we drive our equipment hard, we tend to observe shorter service intervals than those recommended. Once a machine reaches 1500 hours, we like to trade it in on a new piece of gear, because we have found it really pays to have top equipment in peak condition all the time, simply because of the productivity this approach delivers for us,” said Jamie. “A well-designed and well-engineered piece of equipment like the Toro also has the benefit of being very intuitive and simple to use, even for novice operators. We find that even putting an apprentice or a novice operator on the machine, they can become proficient and master the controls very quickly and feel right at home on the machine from the very first minutes,” said Jamie. “These machines pay for themselves in the first 12 months! You don’t get a better return on your money than that. The Toro is built for tough work and that’s exactly what we give them, day in day out. Whether it’s cleaning our job sites, preparation of the surfaces, getting ready for laying turf, the Toro TX 1000 just rips through the day!” said Jamie.